Welcome to the Gold Leaf Retrievers! 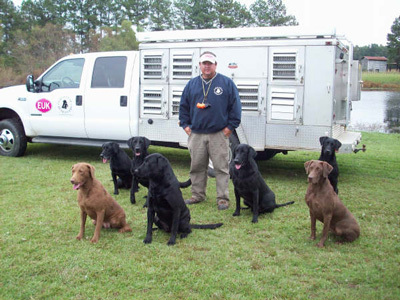 ​We are a full-time training kennel located in Southeastern North Carolina. We concentrate on all levels of hunt tests, upper level gun dog training and basics for field trial prospects. Thank you for visiting Gold Leaf Retrievers! Together with my co-trainers, Juan Rosas and Dillon Bass, we have over 35 years of training experience. We have titled several Master Hunters and Master National Qualifiers. Juan has Field Trial experience doing the basics for several Field Champions and National Finalists. We run local hunt tests and are able to maintain a solid 5 day work week. We are also looking forward to breeding some very high quality litters in the near future. ​Please contact us for a training program that will fit your needs.